The ECU (Equality Challenge Unit) national conference 2016 took place at the Nottingham Conference Centre on the 29th and 30th November. The art-decor style building exterior lead into a vibrant modern interior which doubles as part of Nottingham Trent University, making it an ideal setting for discussing issues relating to Higher Education. Professor Janet Beer, Chair, and David Reubain, Chief executive at ECU opened the conference with introductions. The aim of the conference was to foster connections between HEIs on common factors of equality work to aid build a stronger community of practice for equality in HE. CONNECT – COLLABORATE – SHARE was the theme of the two-day national conference which provided keynote presentations and for the first time, the conference was programmed around a mixture of learning sessions (workshops) and papers delivered by institutions across the UK. This provided the opportunity to explore ideas linked to a specific topic in more depth, delegate participation and detailed analysis of the subject at hand by breaking into smaller groups. Building a ‘business case’ for equality and diversity: facilitated by Professor Candy Rowe, Professor Judith Rankin and Louise Jones, Newcastle University. and a panel of papers on Partnerships for student equality. As a student of University of the Arts London at the time finalising my dissertation on using videography as a platform to discuss race matters at UAL, I was relieved to observe that the ECU conference offered plenty of food for thought on race matters. I was particularly impressed, though by no means surprised NUS President Malia Bouatti’s keynote speech further emphasising her commitment to highlighting the plight and oppression of Black and marginalised students. However I was surprisingly taken my University of Essex Vice-Chancellor Professor Anthony Forster’s keynote addressing his by-all-means-neccessary stance on narrowing the gender pay gap at his institution. Impressed by this attitude from a member of senior management, I couldn’t help think that perhaps if HEIs UK-wide applied the same attitude towards inclusion of BAME (Black and Minority Ethnic) students and staff perhaps we wouldn’t be facing the same shocking attainment gap and retainment statistics. A highlight of the conference for me was being in a space which addressed “whiteness” and “privilege”; factors often eliminated from the race discussion. Though these were in the form of workshops, and not addressed to all participants of the conference, having an opportunity to engage in conversation about the non-‘other’ was enlightening. Another highlight was the opportunity to share my personal perspective as a student to HE academics and staff. My paper ‘Diversity Matters: addressing (BAME) black and minority ethnic representation within the arts: A reflective account of my “awakening” in UAL‘ touched on often feeling marginalised due to my racial category and gender, and how launching Diversity Matters allowed me to connect with other students and staff, through collaboration, to find common grounds for self-empowerment. 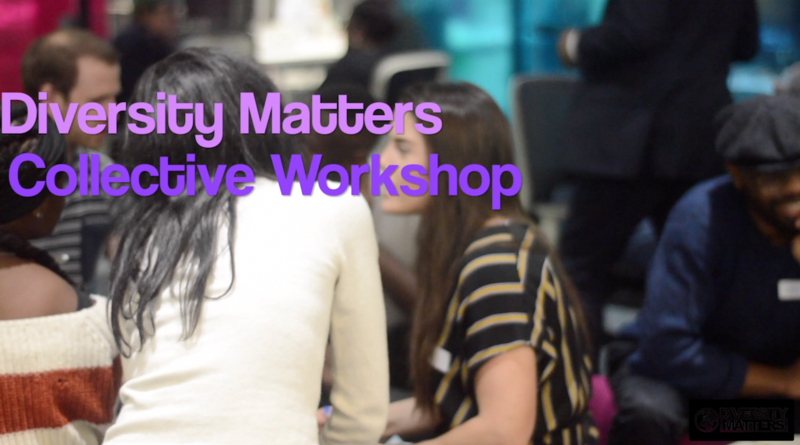 The presentation (available upon request) ended with the screening of “Diversity Matters: Let’s Talk About Race” short film which shares various views on diversity from staff and students of UAL (CLICK HERE to watch). Supporting literature and colourful Diversity Matters postcards (kindly sponsored by UAL Diversity Team) were given to delegates. The theme of the conference ‘Connect, Collaborate, Share’ is timeless as it is innovate, and the essence of connecting, working together and learning from successful as well as unsuccessful practice to promote equality across HE should be ongoing. Special thanks to ECU and the UAL Diversity Team for the opportunity to attend and present a paper on behalf of UAL. ← “Let’s Talk About Race” dissertation submission! Great article! This will make for an excellent presentation at the Race Champions Forum.